Create your own chorizo meatballs with plenty of smoked paprika to give them that distinctive Spanish flavour. Don't forget to share the moment #youplateit with us on Facebook or Instagram! Preheat oven to 200°C. Wash the fresh produce. Heat a medium-large pot of salted water to boiling on high. Peel and mince the garlic. Small dice ¾ of the onion (you will have remainder). In a bowl, combine pork, &frac13; of the diced onion, ½ the garlic, spice mix, and ½ teaspoon of salt. Mix well to combine. Roll mixture into 6 evenly sized, 3 cm balls and add to a lined baking tray. Bake until golden brown, about 20 minutes. Heat oil in a pan (or pot) on low to medium heat. Add the remaining onion and remaining garlic. Cook for about 5 minutes, or until softened, stirring occasionally. Add the diced tomatoes, increase the heat to medium. Cook 8 to 10 minutes, or until slightly thickened, stirring occasionally. Taste sauce and add salt and pepper as needed. Add meatballs to sauce in pan to heat through once cooked. Peel and medium dice the potatoes into 1 cm cubes. Add to the pot of boiling water. Cook 12 to 14 minutes, or until tender when pierced with a fork. When ready to mash, drain and return to the pot. Season with salt and pepper. Add a dash of milk (or water), and butter to taste. Using a potato masher, mash to your desired consistency. Set aside, covering to keep warm. In the meantime, heat a pot of salted water to boil. Cut the carrot into 2 mm coins. Trim the ends off the Broccolini and discard. Cut Broccolini stems into 1½-2 cm pieces, leaving the florets in tact. Add the carrot and Broccolini to the pot of boiling water. Cook for about 2-3 minutes, or until cooked as desired. Drain the water from the pot. 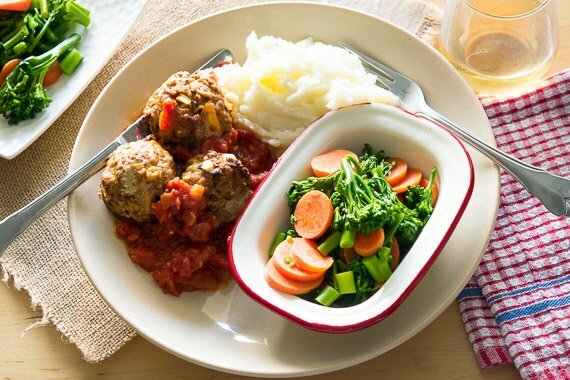 Divide sauce, meatballs, carrots, Broccolini and mash evenly between plates. Enjoy!